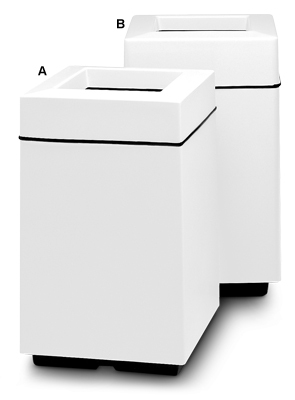 Square fiberglass trash receptacles with plenty of colors to pick from to complement the color scheme of your facility. Fiberglass construction offers a smooth, stain and tarnish resistant, reflective finish. The matching Ash 'N Trash receptacles include an ash-top for collection of cigarette butts and ashes. Rigid poly liner is included with all units. Receptacle tops lift off for servicing. 24, 25, & 30 Gallon Capacity.